It appears that for the second straight season that the New York Yankees will not be buyers at the trading deadline. They last made significant upgrades in 2014 when they acquired Brandon McCarthy, Martin Prado and Chase Headley in an attempt to send Derek Jeter into retirement with one final October moment. The Yanks ultimately fell short that year before rebounding to make the Wild Card game last season. It is a strange predicament for the Bombers as they are usually looking to upgrade for an annual playoff push. One of their most successful deadline (or in this case, an early deadline) acquisitions came in the year 2000, also known as the year I got married, when they obtained David Justice. The 2000 Yankees were gunning for their third consecutive World Series Championship and toward the end of June they were in second place in the American League, three games behind the Toronto Blue Jays. This was uncommon occurrence since they were on cruise control in the division the prior two seasons. So, on June 29th (a special day indeed…..my birthday), New York swung a deal with the Cleveland Indians, acquiring the power-hitting Justice who had already hit 21 home runs. In return, the Indians received 1998 World Series hero Ricky Ledee, right-handed pitcher Zach Day and fellow righty Jake Westbrook, who would win 105 games in the Majors. The Bombers got hot, building a nine game lead by September 13th before stumbling down the stretch and eking out the division crown. Meanwhile, Justice clubbed 20 home runs in 318 plate appearances, finishing with a career-night 41. 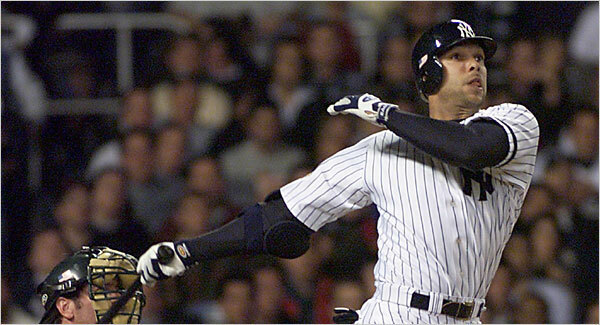 However, the best was still to come for the veteran slugger. After producing four hits in 21 plate appearances in the five game divisional series vs. the Oakland A’s, Justice had only six hits in 28 plate appearances in the six game American League Championship Series vs. the Seattle Mariners. However, four of those six hits went for extra bases including two home runs. In fact, it was his seventh inning, three run-blast that put the Yankees ahead for good, propelling them to another World Series appearance while Justice was named the ALCS Most Valuable Player. The Yanks, of course, would go on to capture their third consecutive World Championship, a five game victory over the New York Mets.